If you are a family or group seeking not only to move to one of the most beautiful parts of Australia, but to find an excellent niche farming business to match, it is hard to go past here. If you are a foodie or chef, there are many possibilities. In fact, bring your passion to all the opportunities this farm and business now provides. This spectacular 140 acre (56ha) property directly adjoins the World-Heritage Gondwana Rainforest (Mt Barney National Park) and is a paradise for nature lovers. It has an abundance of wildlife, elevation and spectacular views, a permanent spring-fed waterhole, flowing gullies, and vegetation that includes rainforest and dry eucalyptus woodlands. Kalangadoo Organic is an iconic award-winning South Australian business focussed on supplying the local community with premium quality fresh produce and value-added products. A 1920s W2 Class Melbourne Tram (no. 347) lovingly restored forms the spine of this home. Situated on 10 acres of high quality dry Sclerophyll bush, the home includes 2 bedrooms, study (or 3rd bedroom), galley kitchen, open plan living/dining area and laundry/bathroom/toilet. and a separate studio space. The central saloon of the tram forms a functioning galley kitchen; 4-burner LPG stove, ample storage and solid wood preparation benches. Designed as a commercial art studio and gallery, a lovely private aspect above the famous Gippsland Lakes provides a range of opportunities. With plenty of land (over 5 acres), camp here whilst you build your home, and/or possibly build some cottages for yourself and the B&B market. Perhaps consider sub-division. With some small conversions use as a weekender/gallery for your work. This farm and business is now ready to pass on to the next generation of farmers committed to growing food for Australians. It provides excellent employment opportunities for the full range of skills and expertise within a family and business. 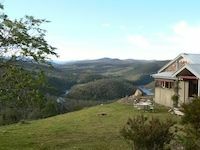 A very private farmlet consisting of about 2 acres of cleared land and about 14 acres of a mix of natural bush including Gippsland Red Gums, revegitated local species plus a large dam. This area is ideal if you are a nature lover of native flora and fauna.